The Midland Gardens three bedroom apartment will not last according to listing agent Francis Morris. 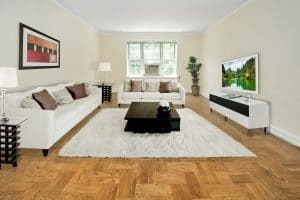 This three bedroom apartment is located in the heart of the Village of Bronxville. It is about one half mile from the metro north (28 minutes to grand central). There is a path from the complex that commuters take when walking to the train. With a ton of pre-war charm at this quiet complex, it has become a favorite among buyers. There are not many three bedroom apartments for sale in the Bronxville School District. The average price of single family homes in the district is over 2 million dollars. At a price point under a million, buyers can have their children attend Bronxville schools in a large, beautiful apartment. Which is a real plus for families looking to not only to have their children attend, but also be in walking distance from school and town. Less than .5 mile away is a variety of restaurants and stores from shoes to olive oils. Just recently an acai bowl company opened, and it is a hit! Children and adults of all ages visit at all times of day for a healthy snack. The over-sized apartment truly lives like a home, with an flexible floor-plan that is open for your vision. Buyers looking to renovate an apartment to their liking has hit the jackpot with this unit. With 1650 square feet, the size of a small house, there is a ton of potential and room to design a beautiful flowing home. There are hardwood floor’s throughout and the most private entrance at the complex. The apartment comes with a parking space and a storage unit. The LOW maintenance that includes all utilities is also a plus for buyers. For more information about this Midland Gardens Three Bedroom apartment or buying and selling in the area, please email sales@barhiteandholzinger.com.